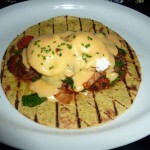 This was one of our most-anticipated brunches in quite some time. Not only was it the first time that we would be dining at The Source, but we postponed our original reservation for six weeks because of our busy schedules. And because The Source only offers its dim sum brunch on Saturdays, I was literally counting down the weeks until the date finally arrived. Why? Well, this is no ordinary brunch. 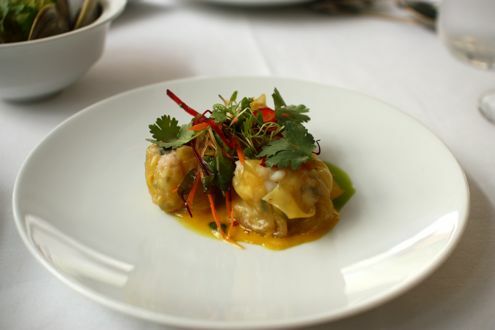 Wolfgang Puck’s DC establishment features the renowned cooking of executive chef Scott Drewno. While dinner at The Source is very expensive, their brunch, which was launched a little over a year ago, is rather affordable. For $32, you have a choice of five tastes from nearly 30 small plates. For an additional $10, you can choose eight plates instead of five. The latter option is ideal for parties of two, and that’s what Rachel and I decided on. The only problem was figuring out what to order – there were a lot of appealing dishes to choose from! Considering that the two of us are one of the most indecisive couples on the planet, we finally agreed on eight tastes. 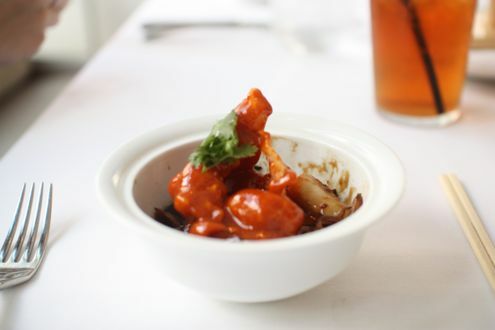 Our first dish of the day was the Chow Feung. 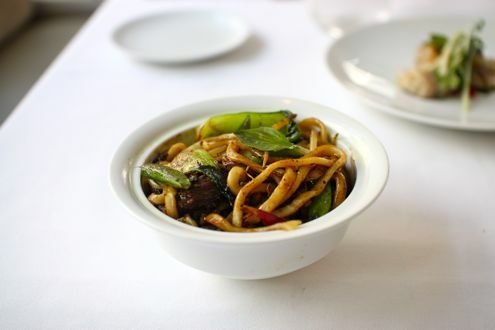 Featuring thick yet delicate noodles and spicy rock shrimp in a sweet soy sauce, it became an instant favorite. But as we kept trying to finish the noodles off with our chopsticks, our other plates soon began to arrive. 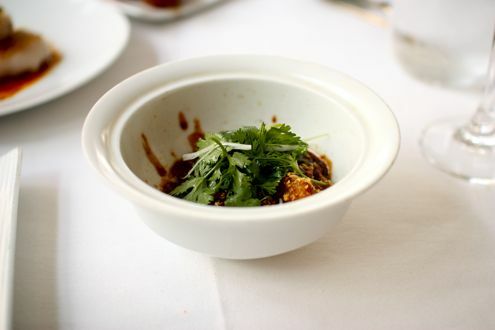 Up next was the Shanghai Noodles, which was comprised of braised oxtail, curry, and chili. It was a hearty, satisfying portion of noodles with just the right amount of kick to it. 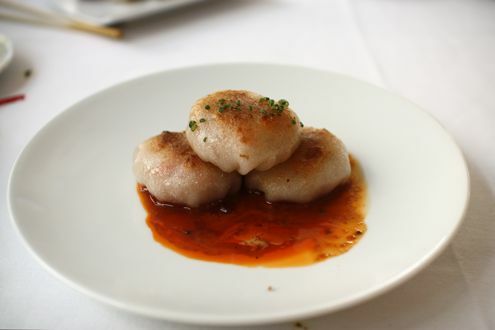 Of course, it’s not dim sum without dumplings, and we certainly had our fair share of those during brunch. First up was the Sea Scallop Sui Mai. Gorgeously presented, it was sitting atop a few tablespoons of curried lobster emulsion. 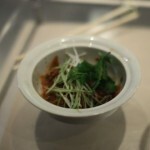 Next was the “Szechuan Dan Dan” dumpling, which was comprised of organic chicken and a very addictive peanut sauce. After some heavy dishes, things lightened up a bit with the Garlic Littleneck Clams. 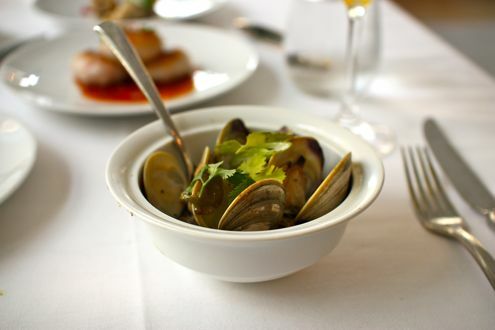 Prepared with cilantro and sambal, the clams were sitting on a bed of delicious cellophane noodles. Of course, I had more than enough room for the restaurant’s trademark duck bao buns. 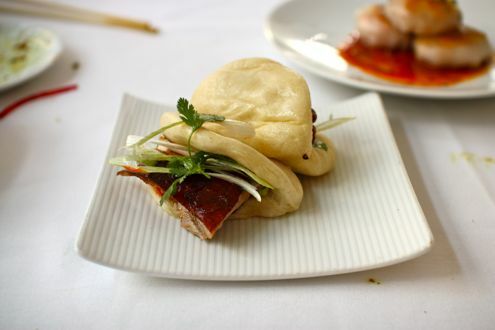 Stuffed with crispy, succulent duck that’s lacquered overnight, the buns were simply fantastic – a must-order dish. 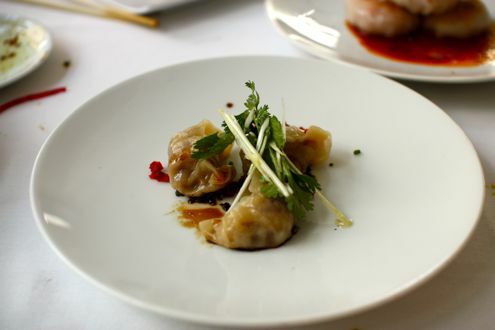 Moving onto our seventh taste, we opted for Pork Belly Pot Stickers. 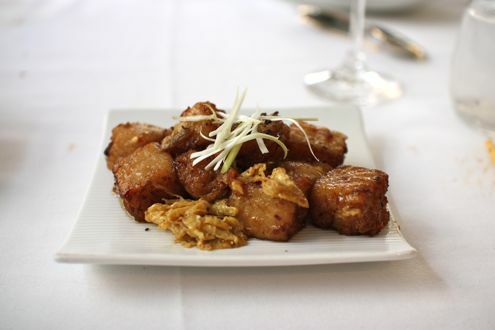 I mean, it’s not brunch without pork belly, am I right? 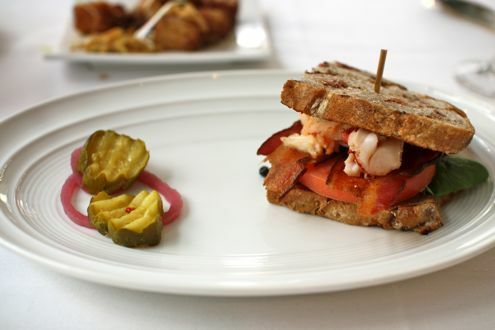 Just as we were ready to cry out uncle, out comes our final taste of the day – the Maine Lobster Club. This could nearly be an entree in itself, what with the chunks of lobster sandwiched between two delightfully satisfying slices of walnut bread. Oh, and did we mention the bacon vinaigrette? Unfortunately, we were so full that we were only able to eat a few bites and had to get the rest wrapped up. Let me reiterate, despite the fact each dish is called a “taste”, these plates are generously portioned. Just as we were tapping out and entering a food coma, out comes Chef Drewno himself! He mentioned how his travels to China inspired him to launch the dim sum brunch and that he has been continuously adding dishes to the menu while making the typeface smaller. Gotta love that. Dim sum brunch at The Source was hands down one of our favorite brunch experiences throughout the entire Washington area. Between the quality of the food, the size of the portions, and the price you’re paying, it’s an incredible value, especially when you compare it to how much you would spend on dinner at the very same restaurant. Rachel and I would go back in a heartbeat not only because there are so many more dishes to try, but also because the food was just so damn enjoyable. If you want to try Chef Drewno’s cooking without breaking the bank, we cannot recommend The Source enough.